Love is in the air! 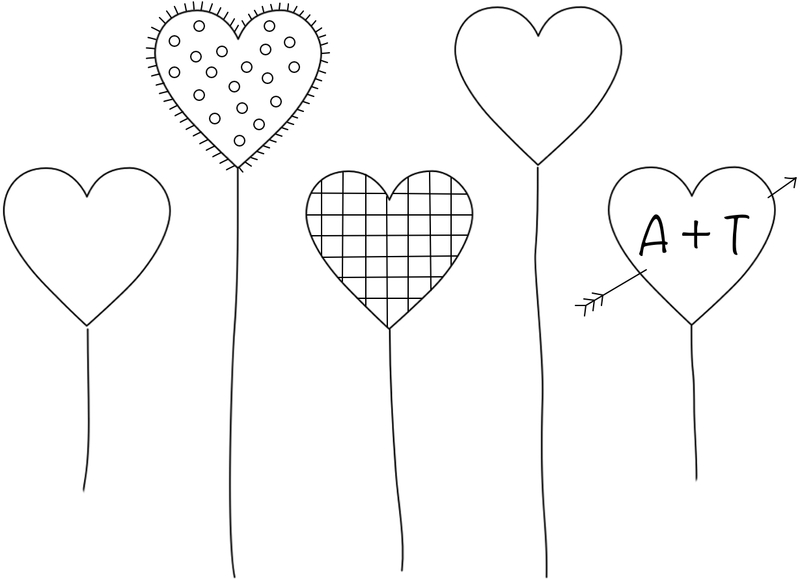 Spread some love around with these five FREE heart embroidery patterns! Featuring five unique heart designs, this simple PDF pattern is sure to evoke feelings of mushy, gushy love. The patterns can be stitched as a stand-alone project — either framed in the hoop or displayed in a wooden frame — or, the individual hearts will make a great addition to a tea towel, scarf, blouse, bag, and so much more. This set of five fun heart patterns are designed with simplicity in mind. 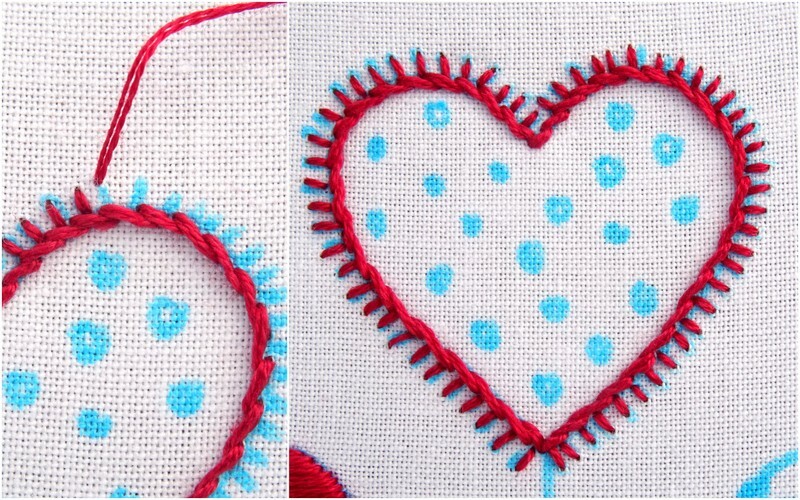 Using only five stitches and two colors of floss, these simple hearts can easily be stitched in large or small sizes. Embroidery Hoop to fit the pattern. This pattern was created for a 7 or 8-inch hoop, but you can re-size the pattern as you like. Fabric big enough to fit the hoop for a stand-alone project, or the item you wish to embroider. Embroidery Floss in the colors of your choosing. Two contrasting colors will yield the best results. I used DMC 816 & 761 for the hearts and DMC 3799 for the optional strings. 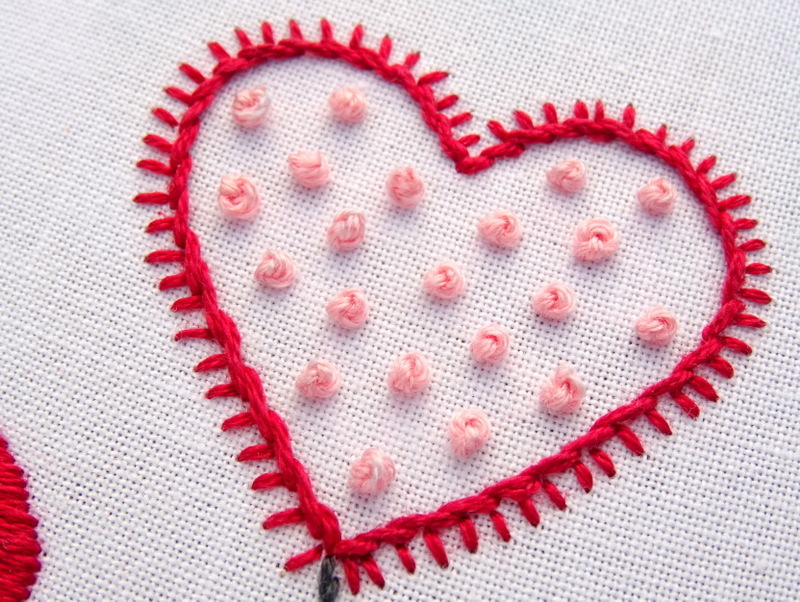 Free Heart Embroidery Pattern: Download and resize however you like. Pattern transfer instructions are included in the PDF. Sewing Scissors, a Water Soluble Marking Pen and an Embroidery Needle. 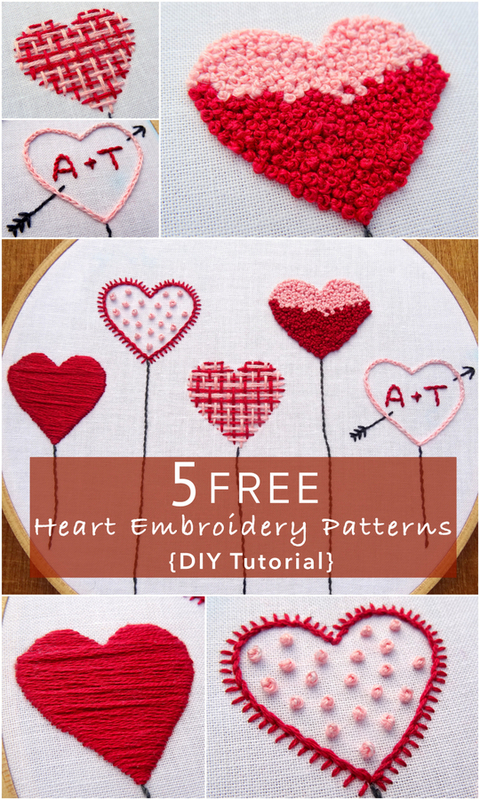 I have created a free downloadable pattern featuring five basic hearts. You can download it HERE, or by clicking the title above. The PDF includes instructions for transferring the pattern to fabric. Once you have your pattern on the fabric come back here for further instructions. Let’s start with a classic red heart. 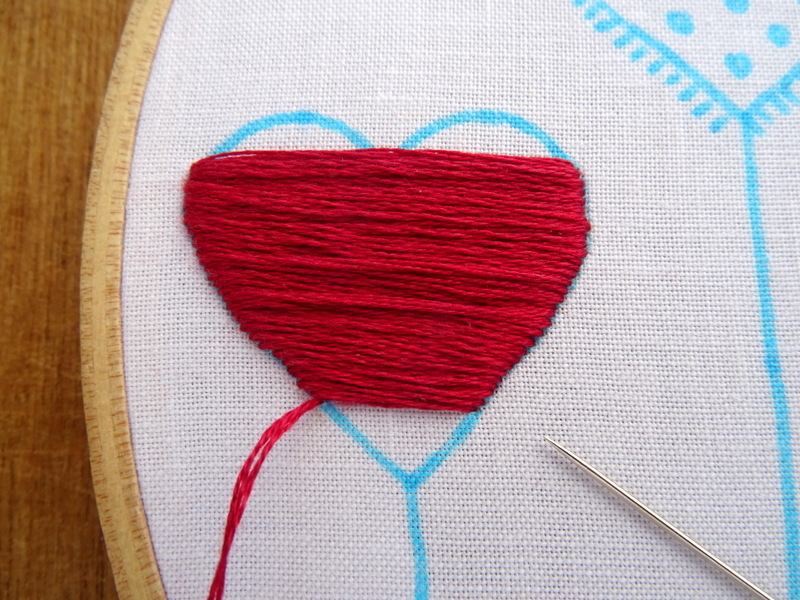 This simple heart is stitched with a deep red floss (DMC 816) using satin stitch. The end result is a smooth, satin-like heart bursting with color. For a refresher on satin stitch along with some extra tips, visit the Satin Stitch Embroidery Tutorial page. Begin by threading your needle with floss. For this size heart, I used four strands of DMC floss. 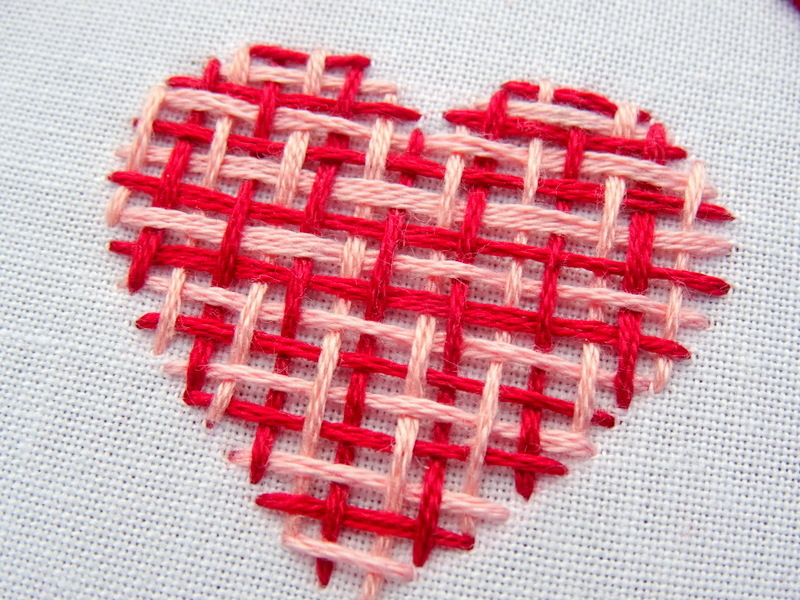 If you are stitching smaller hearts, I would recommend using only two or three strands. Bring the needle up at the edge of the heart and back down on the other side. I find it easiest to start either in the middle of the heart or up near the top where it begins to curve inward. 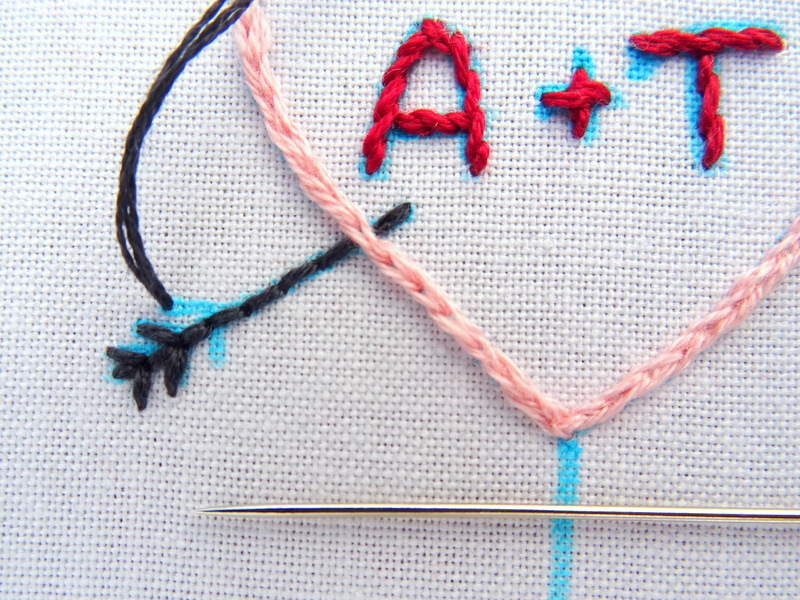 For the second stitch, bring the needle back up right below the first stitch and down on the other side of the heart. Continue stitching in this fashion until you reach the bottom of the heart. Create a smooth finish by keeping the stitches close together without overlapping. 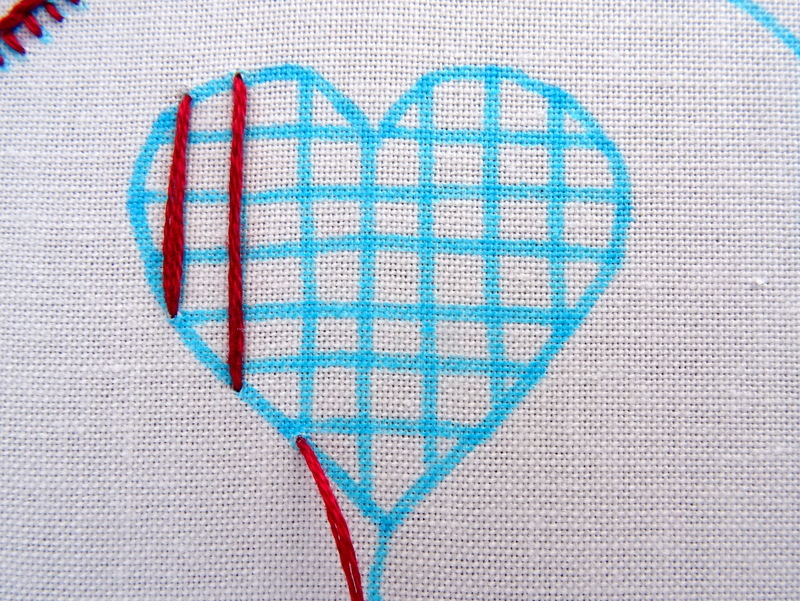 When you reach the bottom of the heart, flip the hoop over and thread the needle up through the back of the stitching. Bring the needle to the front at the point where the two heart “bumps” join together. Using the same method as the bottom section, stitch across and up one of the bumps. Repeat the process on the other side until you have a smooth, satin finish heart. I like to call this one Heart Throb 🙂 Although this heart uses three different stitches it really couldn’t be simpler. 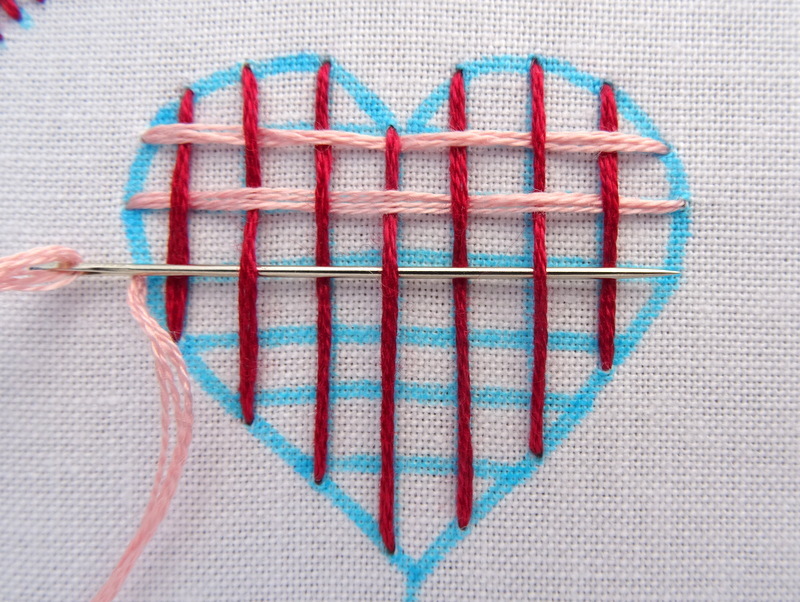 Start by outlining the heart with stem stitch using one of your two floss colors. I chose four strands of deep red (DMC 816). Next, give that heart some “throb” by adding small back stitches all the way around. 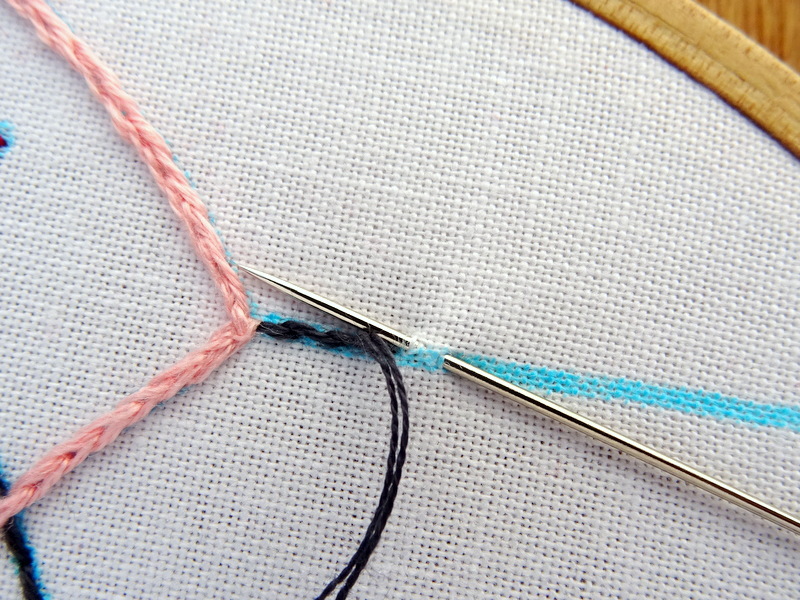 For a more in-depth tutorial on both Stem and Back stitch, visit my Basic Embroidery Stitches: 4 Line Stitches tutorial. 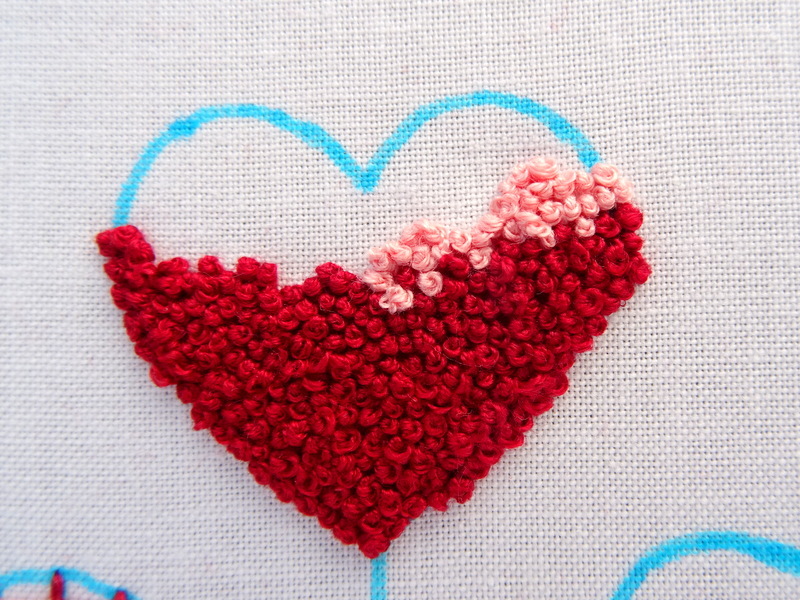 Finally, fill in the middle of the heart with a smattering of french knots stitched in a contrasting color. I used four strands of pale pink (DMC 761). 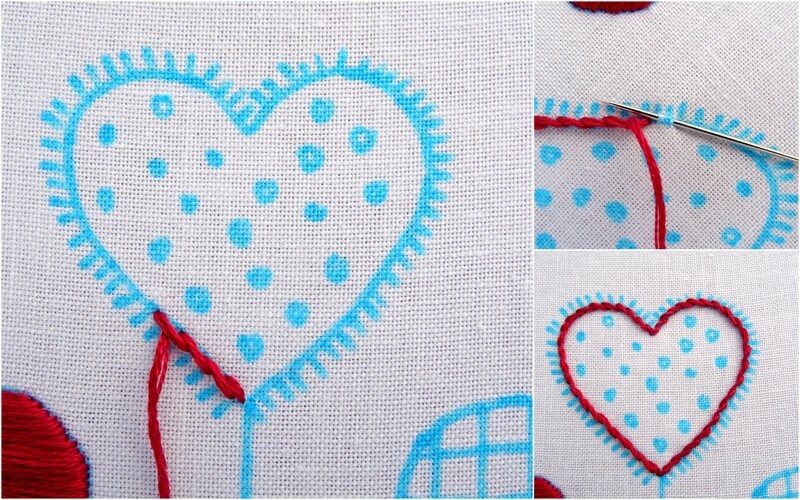 A complete guide on french knots can be found on my French Knots Embroidery Tutorial page. It almost feels wrong to call this an embroidery pattern since it hardly requires any actual stitching. All that is required are two contrasting color threads (I used DMC 816 & 761) and a little bit of weaving. Starting with the vertical lines, make a long stitch along each line. With the contrasting thread, come up on one side of the topmost horizontal line and weave through the vertical lines without going through the fabric. Bring the thread to the back and then up again at the start of the next line. You could be done with the heart at this point. I originally intended to only create one set of horizontal and one set of vertical lines. But at the last minute, I decided to fill it in with one more set of lines in each direction. I have kept the pattern as is, with only one set of horizontal and one vertical, but if you want to add more, simply repeat the above process between the original lines. What’s better than a smattering of french knots? 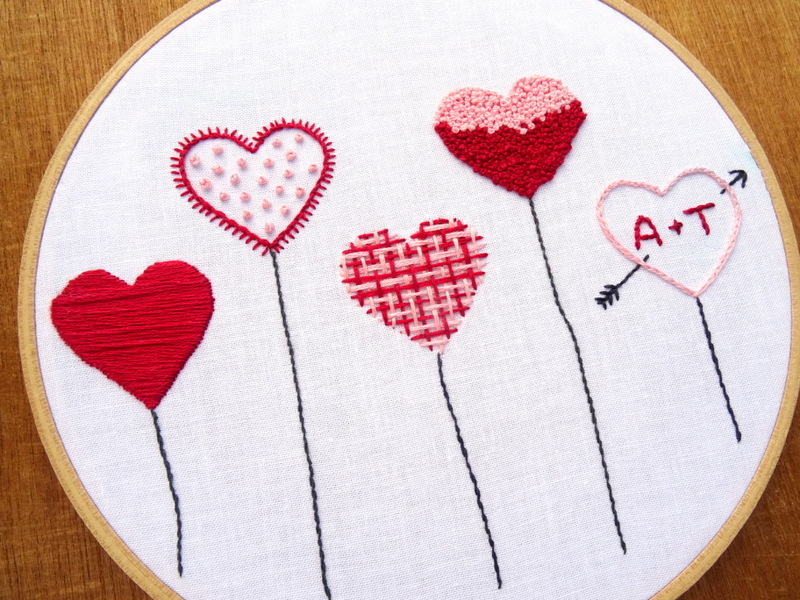 How about a whole bunch of french knots stitched close together to create a fun, textured heart bursting with color. You can either use a single color thread or follow my lead and incorporate two contrasting colors. 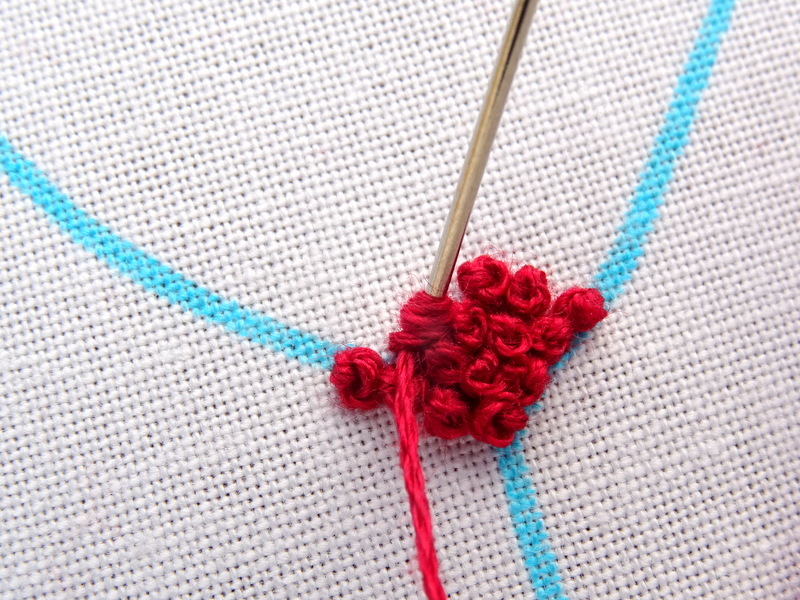 Start at the bottom of the heart and begin filling it in with french knots. Place the knots close together to create a uniform shape filled with nubby little knots. 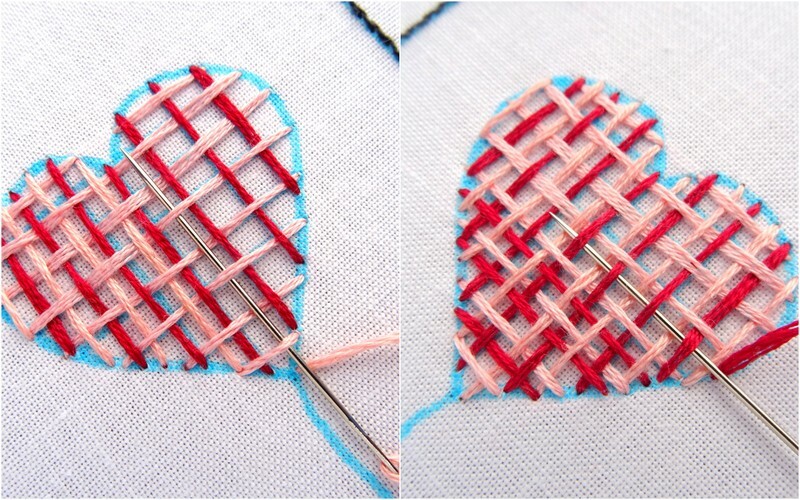 Keep the edges of the heart crisp by stitching up the edges before filling in the middle. 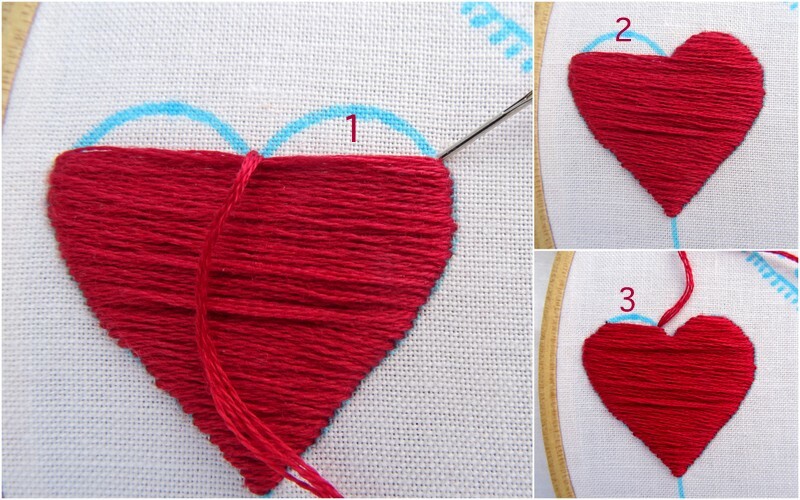 If you are using two contrasting colors, end the first color near the center or top of the heart. You can leave a straight or jagged edge. I finished the first color with a jagged edge a little more than halfway up. 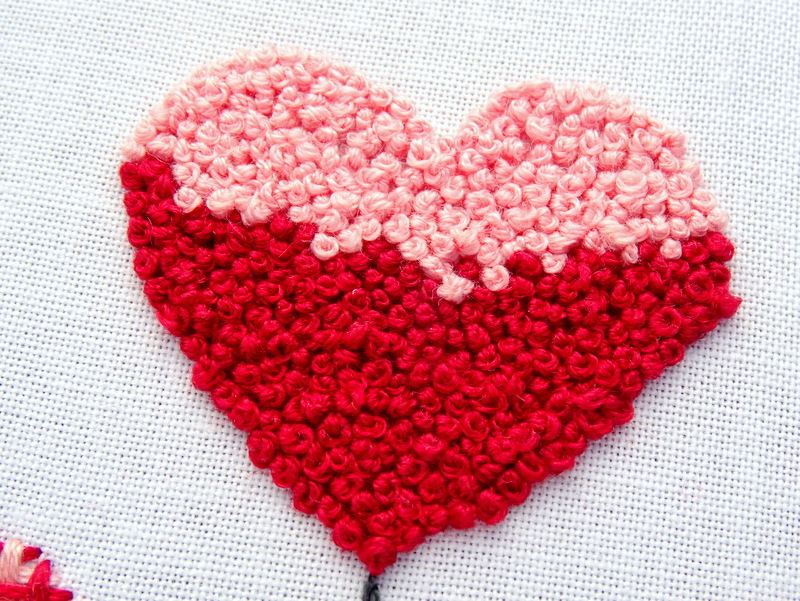 To finish, fill in the rest of the heart with the second color. While I hate to choose favorites, of all the heart embroidery patterns, this might be my favorite. 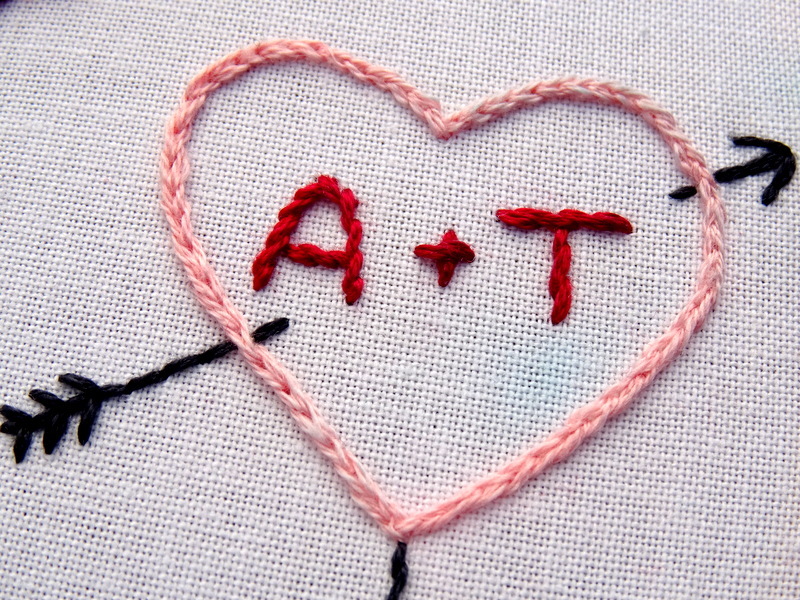 Of course, the could be because the initials in the center are mine and my husbands! The text is included on the downloadable PDF, but you can, of course, change it to your liking. Simply write in the correct letters on your fabric using a water soluble pen. 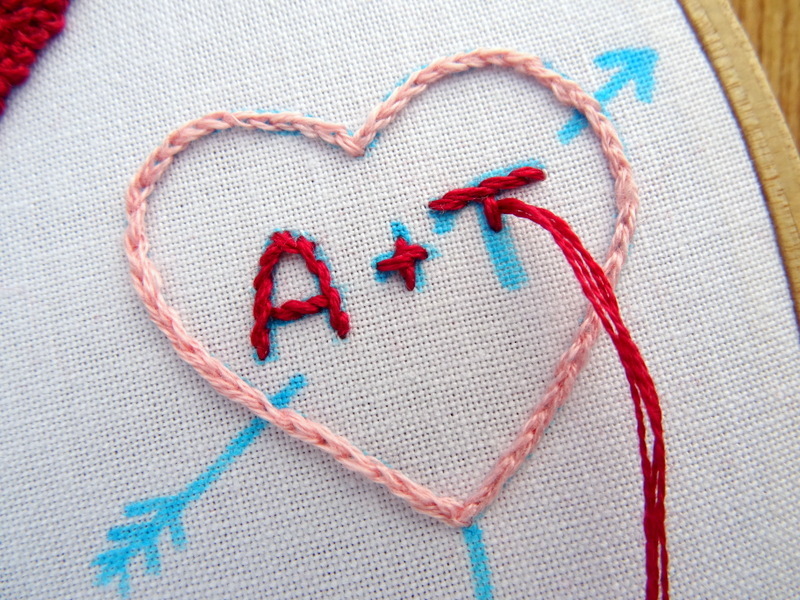 You can also omit the text altogether and only stitch the plain heart and arrow. 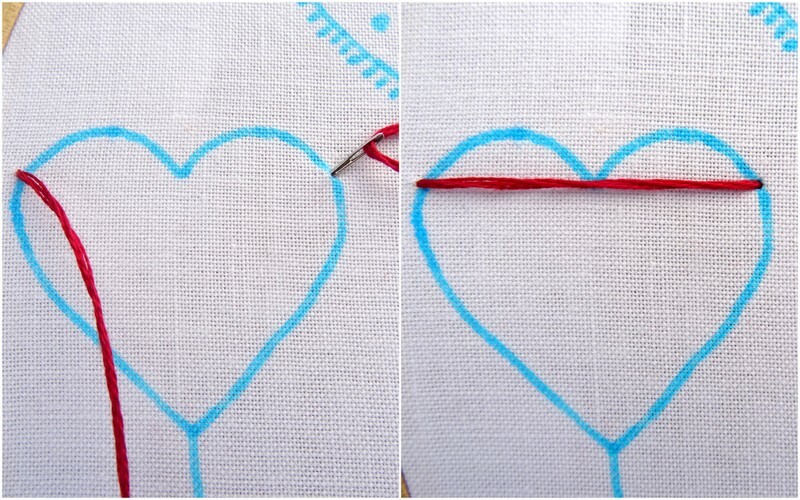 Either way, begin by outlining the heart with split stitch. I used four strands of DMC 761. The complete instructions for split stitch can be found in the Basic Embroidery Stitches: 4 Line Stitches tutorial. 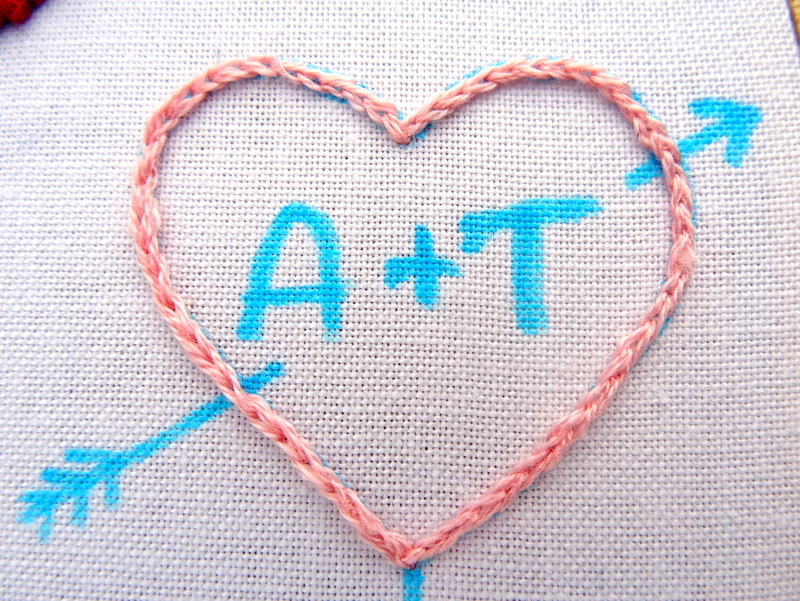 For the initials, I recommend using fewer strands of thread as it can sometimes be difficult to round the small corners of letters with a thicker thread. I used three strands of DMC 816 stitched in stem stitch. To finish it off, stitch the arrow with a dark color — I used a very dark grey, DMC 3799. Using three strands and a back stitch I filled in first one side and then the other. 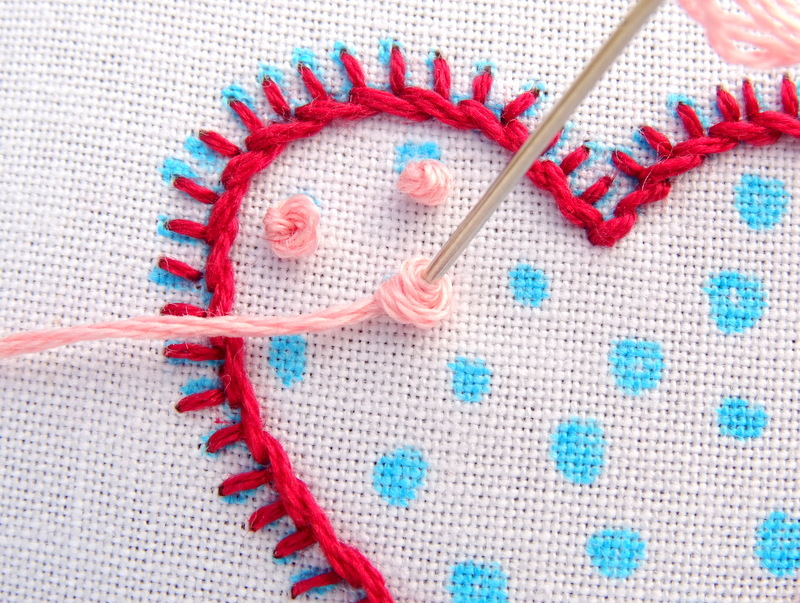 The final finishing touch is to stitch the heart strings with stem stitch. I wanted a very fine line so I used only two strands of dark grey (DMC 3799) in stem stitch. This last step is completely optional but if you are stitching the entire pattern as a stand-alone piece, I think the strings make for a nice finishing touch. 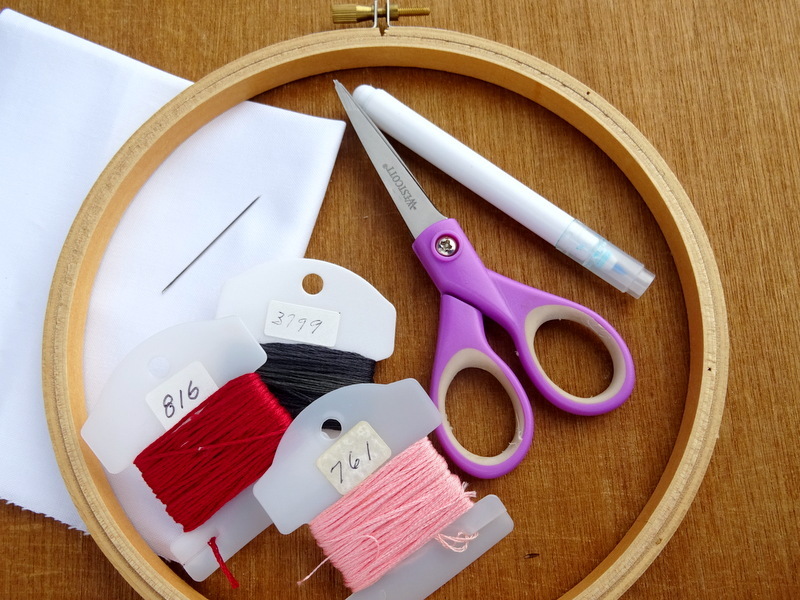 Want to finish your embroidery by framing in the hoop? Check out my step-by-step guide: How to Finish an Embroidery Hoop. Want More Heart Embroidery Patterns? 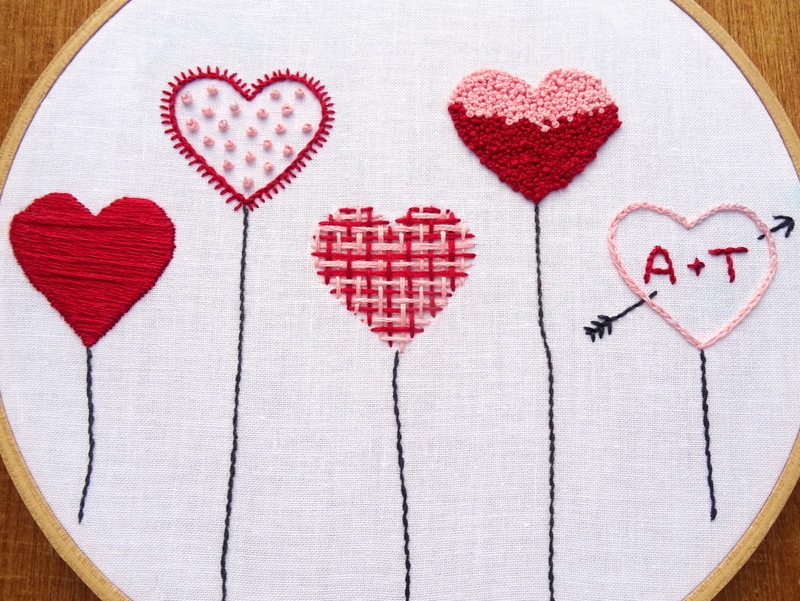 Need more embroidery hearts in your life? 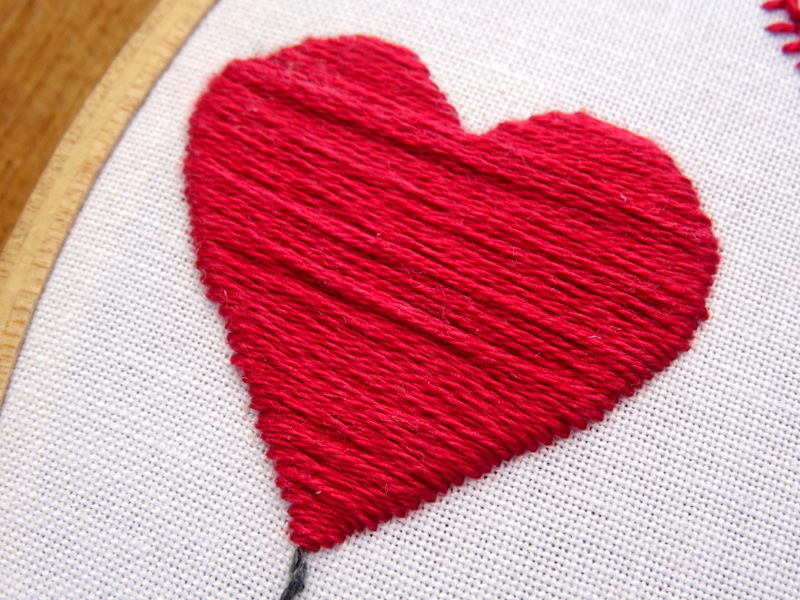 Discover a variety of patterns featuring hearts on my Wandering Threads Embroidery Shop Page. 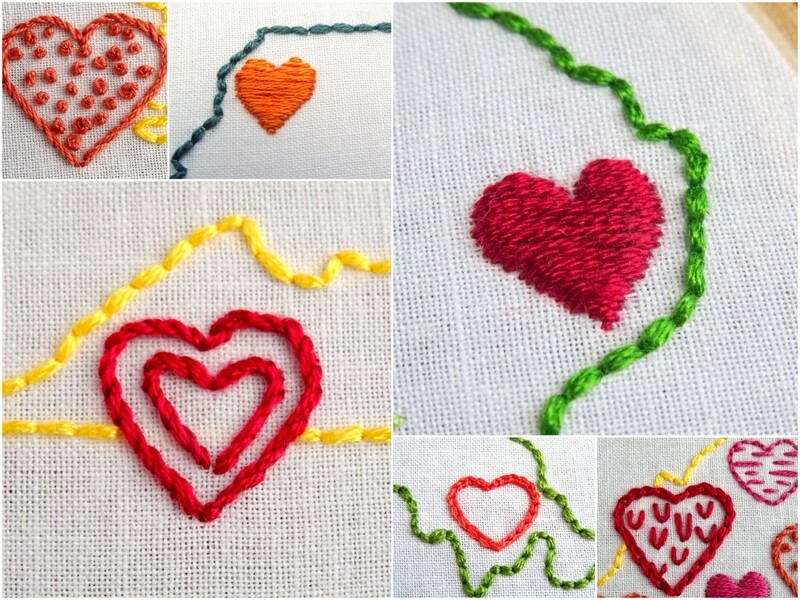 Many of the state patterns include a heart that can be stitched in a variety of ways. 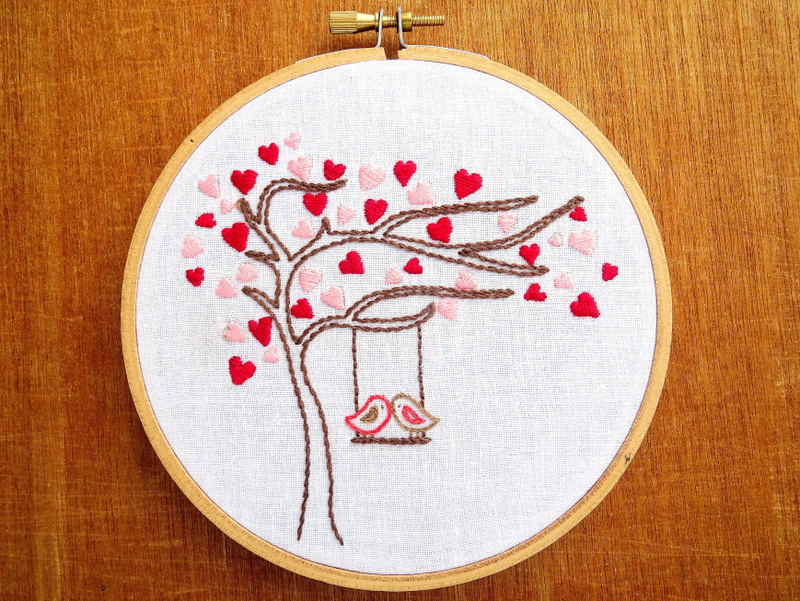 The newest embroidery pattern featuring hearts is the Love Birds Heart Tree. The highlight of this PDF pattern is a whimiscal tree covered with hearts. Two love birds swing on the branches below. Visit the Love Birds Heart Tree listing in my shop to purchase this pattern.